ADVANCE PREPARATION: Sprinkle one side of each slice of bread with cinnamon. With rolling pin, roll bread thin, then cut into 1-inch strips. Place strips, cinnamon sides to pan, on bottom and around sides of a non-stick, 9-inch square pan, or a 9×5 inch loaf pan. 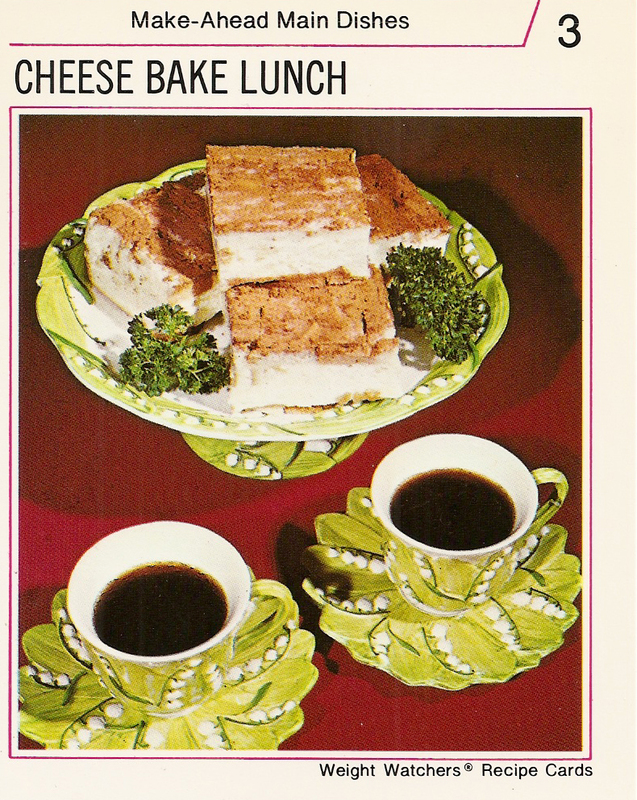 (The cheese filling will fill any spaces between bread strips and will hold the cake together.) Combine cheese, buttermilk, eggs, vanilla, lemon rind, sweetener, and salt in a blender container; process at high speed until mixture is smooth and creamy. Carefully spoon cheese mixture into pan. Bake at 275°F (very slow oven) for 1 hour. Turn off heat, and let stand in oven, 1 hour longer. Refrigerate at least 1 hour. FINAL PREPARATION: Turn upside down onto serving platter. Divide evenly. Makes 4 luncheon servings. Copyright © Weight Watchers International, Inc. 1974 All rights reserved. Printed in U.S.A.